I don’t do a lot of cooking in the kitchen, mostly because I don’t have the patience and I’m just too picky of an eater. Most of the things I like can be made by using the microwave or boiling water, so I stick to what I like. However, if you do enjoy the culinary arts, you might be interested in this handy little measuring device. When you need to measure very small amounts, it can be rather difficult at times. 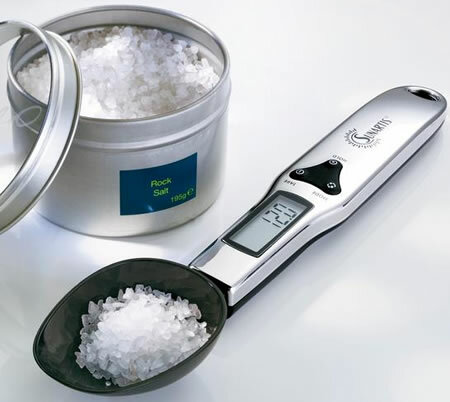 Thanks to this cool Spoon Scale you’ll be able to weigh out your ingredients with ease. It is exact to within 1/10 of a gram. It witches between grams and ounces, depending on your need and has the keen ability to measure additional ingredients as you add them. The Spoon Scale isn’t much larger than your average spoon, and will only set you back $37. please could you let me know who the suppliers if any are for the digital measuring spoon in South Africa?